Learn how forgiveness can make you a stronger business owner. 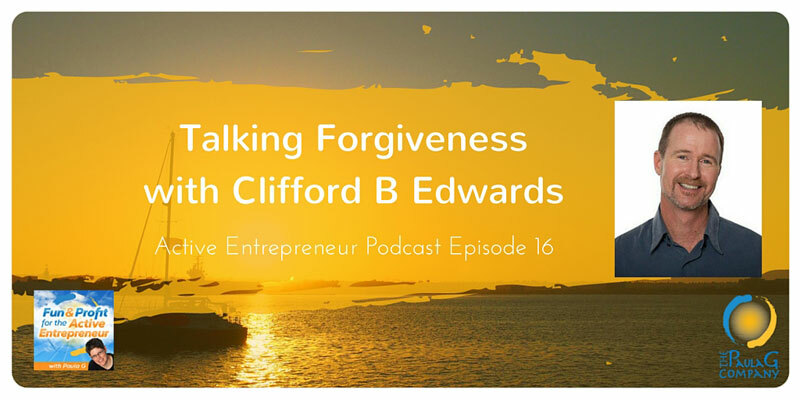 Forgiveness expert Clifford B Edwards joins Paula G for this compelling conversation. I jumped at the chance to interview Cliff because he and I met years ago when I was being trained as a coach by Debbie Ford. I can still hear his voice in my head from time to time! Clifford Edwards is a forgiveness expert, author of the acclaimed book, The Forgiveness Handbook –A Simple Guide to Freedom of the Mind and Heart and developer of The Liberate Processtm. He has been a professional coach, trainer, and consultant in continuous practice for over seventeen years. With best-selling author and transformational leader Debbie Ford, Cliff co-founded the Ford Institute for Integrative Coaching in 2000. As a trainer and key architect of the Institute’s programs for eleven years, he was in charge of all curriculum, and accountable for the successful training of nearly 1000, skilled Integrative life coaches worldwide. So how does forgiveness tie into entrepreneurship? Well, we all have our past “stuff”. If we don’t deal with it, it deals with us in conscious and unconscious ways. Hard to set boundaries with a client? Is your staff running all over you? Sometimes (though not all) it can be rooted in past events. Those events you thought you forgave the people involved, but only did so intellectually, not fully, and so like a rerun the issue is back for another go around in a different circumstance. We talk about the importance of emotional education for the Active Entrepreneur and how you can use pieces of Cliff’s process to set yourself free in a way that is grounded, practical, and not just a bunch of woo-woo, hard to relate to vague notion.